The legendary Larry Sparks and the Lonesome Ramblers will appear on the Appalachian Cultural Music Alliance’s Pickin’ Porch on Saturday, November 17th at 7:00 pm in Bristol, VA. Bluegrass music artist Larry Sparks is featured as the cover story this month in Bluegrass Unlimited Magazine with an article written by Bristol’s Tom Netherland. “The article boasts on Larry Sparks’ 50th anniversary coming up in 2013 and we are so proud to have this renowned bluegrass legend coming to appear on our Pickin’ Porch stage,” says ACMA president John Necessary. Larry Sparks was featured in the recently released documentary titled “Echoes of the Blue Ridge” produced by the ACMA and Chris Rector of Wilderness Trail Productions. The documentary explores the history of the music that was born in the Southern Appalachian Region which includes bluegrass and old time genres. Sparks talks about his time early in his career with Ralph Stanley and some of his times performing over the past 50 years throughout our region and beyond. The documentary is available at the Mountain Music Museum and Gift Shop on the upper level of the Bristol Mall. 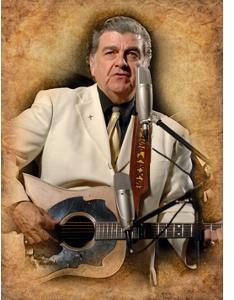 Larry Sparks has been called the “man with the most soulful voice in bluegrass”. His fan base is tremendous throughout the world in bluegrass circles and beyond. He is going to celebrate his 50th year in bluegrass music in 2013 and the ACMA will honor him for this achievement on November 17th in Bristol, Virginia-Tennessee. The concert on November 17th will be on a Saturday evening in addition to the ACMA’s regular Thursday night Pickin’ Porch schedule. This concert will be a fundraiser for the ACMA which is a non-profit organization. The ACMA also organizes and maintains the Mountain Music Museum in the Bristol Mall which is open 7 days a week. Proceeds from the concert will help maintain the Mountain Music Museum and continue the work of the ACMA which includes funding two scholarships at East Tennessee State University for their Bluegrass, Old Time and Country Music Program. Tickets for the concert are $15 and children under 12 years of age are admitted for $5.00. Tickets are available at the Mountain Music Museum at the Bristol Mall and at the door the night of the show. For more information visit www.PickinPorch.org or www.MountainMusicMuseum.org or call 276-645-0035.